When choosing a name such as Rainbow’s End for a winery, you should probably make sure that the locale lives up to it. Naturally, this is the case for the Malan family whose winery really and truly is at the end of where probably any rainbows can form. With a majestic view over their vineyards ranging from 350m to 540m in elevation, they’re quite a gem, tucked away at the end of the Banghoek Valley. Franchois Malan is the father of the family as well as the winemaker who was a civil engineer when he bought the farm in 1978. They only started producing wines in 2000 with 2002 for their first vintage; a Shiraz of just 2,000 bottles. These days they put out 25,000 bottles a year and sell off any additional grapes to other vineyards in the area as their cellar would need to be heavily increased to produce more. 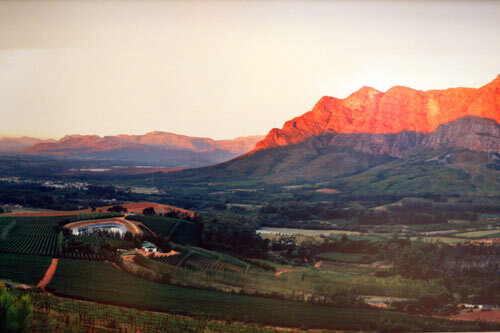 Their tasting fee is a nominal R 15 which is worth it not only for the view, but also their great wines.